The last ten weeks have been full as we have become a family of five. It’s a whole new dynamic. And we are quickly finding a new normal. And honestly I’m amazed to say the only real bump in the road has been sleep. While in China we had some sleep struggles, and after an initial two weeks home of what I might term, ‘happy shock” adjustment and decent sleep, Lydia wised-up. She realized that we are here to stay. Day after day, we were not leaving. And so she has been bonding, like all-in, really tight, don’t leave me ever , bonding. This is great. Except for the fact that she only wanted to sleep in the blue chair with me holding her for hours at a time. Or in our bed, which was not working for either Lars or me. Then came surgery. She did great. She was a champ, and truly we hoped that perhaps how very tired she was post-surgery or the medications she was on would send her to peaceful rest in her crib. Not so. We came home from the hospital on a Thursday and on Friday I attempted this. Didn’t work, not close enough. Then Lars finally said the words I didn’t want to hear. 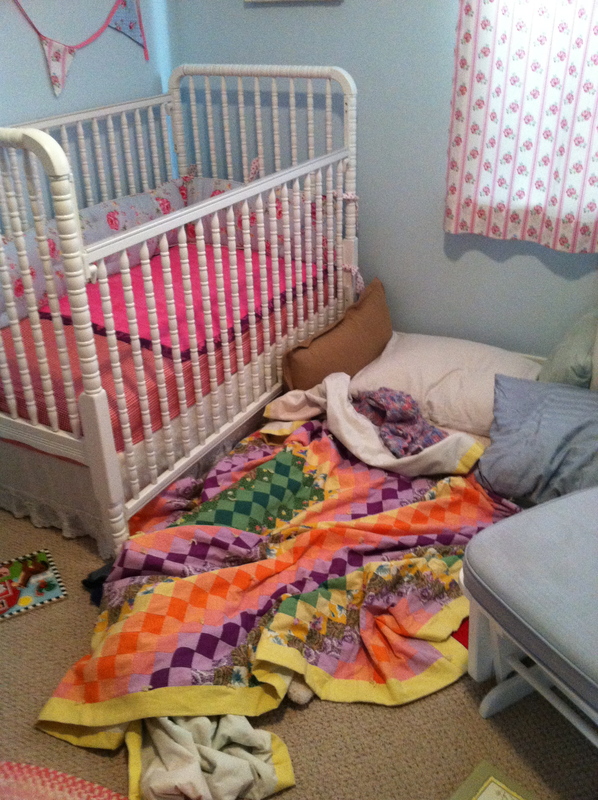 “Kate, I think it’s the crib…” My heart sank, because I knew he was right. It was the crib. 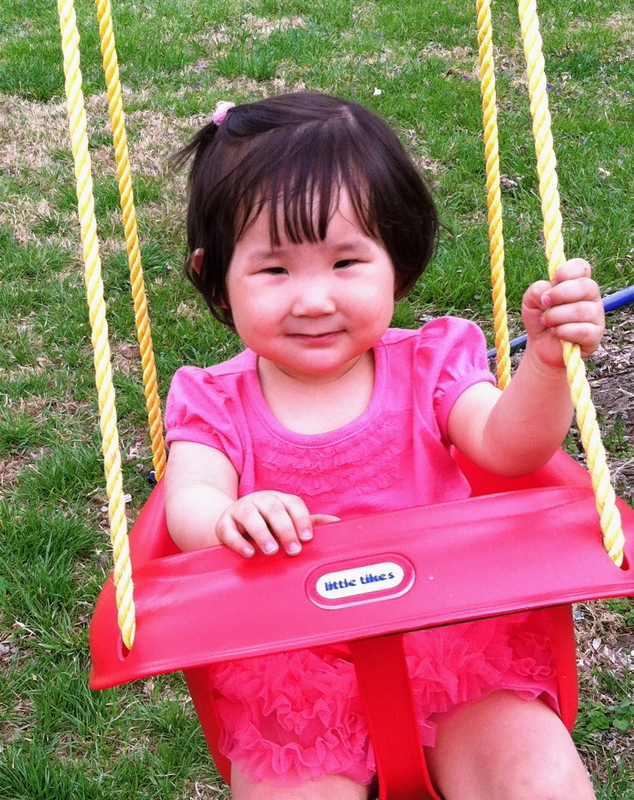 Lydia had spent the first 21 months of her life mostly confined to her crib. It was her playpen, it was where she ate (saw this at the orphanage), slept, and probably sat for hours every day… But for me, her crib meant one thing. It meant she was a Baby. 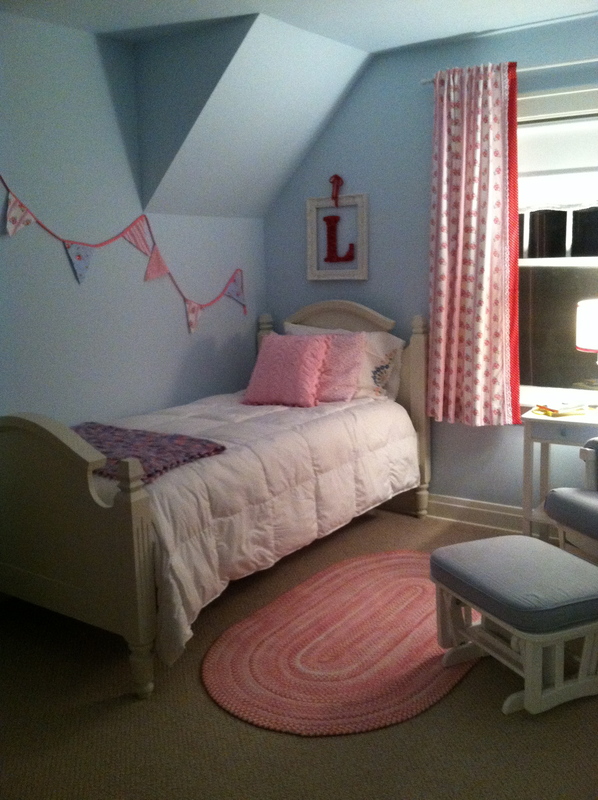 I had sat in my blue chair for months dreaming of and praying for the baby girl who would love that crib. Who I would peacefully lay down to sleep in that crib. My Jenny Lind, gifted to us from the church when Quinn was first born. The bumper, my only spurge, that I had carefully chosen and based the whole room around. The $18 vintage Swedish table-cloth I had turned into a crib skirt after hours of searching on Etsy. I thought she would love it. I roll my eyes at myself when I think of how attached I was to the whole idea of that crib, but when you don’t get to have a pregnancy in anticipation of a child, you put your maternal energies into, cribs and nursery colors and honestly anything that makes you feel like you are preparing for something BIG. So to think of taking it down, meant all those hopes of her loving it were not-to-be. But more-so, it meant I had to be honest with myself and admit that although Lydia seems in so many ways a baby, in truth, she is a toddler. I had to let go of my desire to ‘hold-on’ to the crib, since it was clear it would not help Lydia sleep peacefully through the night. And I had to quickly work through my sadness over each step we had to take away from her ‘baby-dom’. A sweet ‘baby-dom’ that sadly, we had missed out on. We had already had to take-away her bottle prior to surgery, and now the crib too? But the truth remained that Lydia had decided she was done with cribs and no amount of Jenny Lind spindles, or Pottery Barn bumpers or soft blankets would make her like it. She was done. So, just as Lars knew I would, I had a ‘moment’. I sat down in the blue chair, had some tears, took a breath and watched as Lars dismantled the crib. He even left it in the boys room for a couple days, in case I should want to put it back up. But, I knew it was down for good. The next night looked something like this. …Still not close enough for her liking. So, the next day, we decided to go for it. 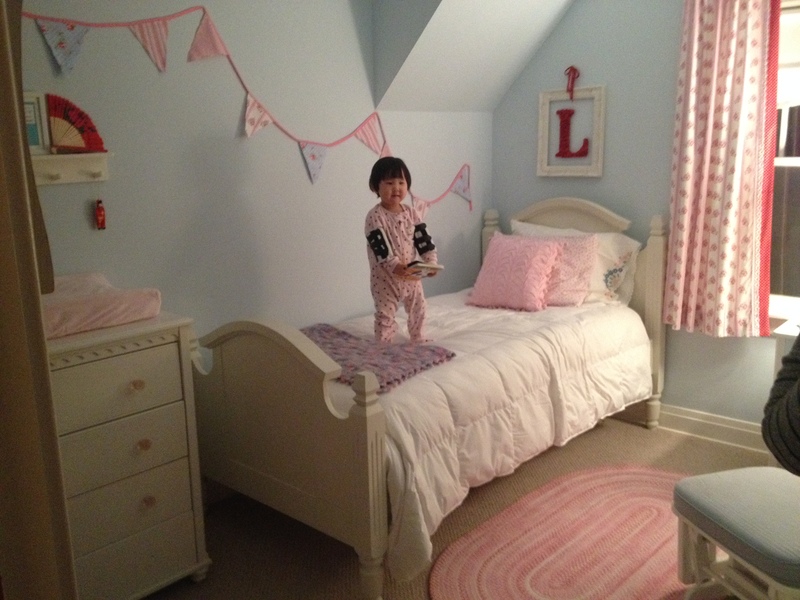 I went mattress shopping and we brought up from the basement the beautiful bed a sweet neighbor had gifted us for Lydia. It was perfect. And Lydia loved it immediately. Again I had tears..this time happy ones. 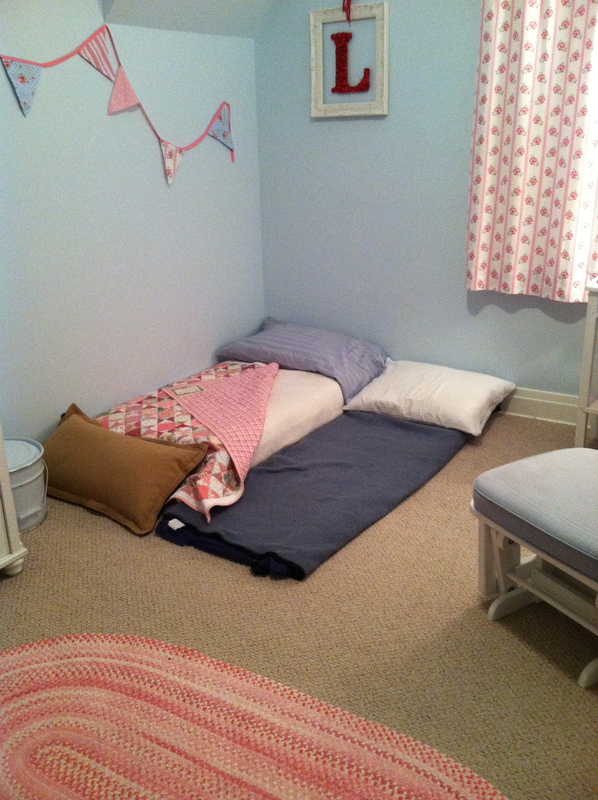 We then spent about a week sleeping with Lydia in her bed: taking turns. She slept, we didn’t so much. We began a very deliberate bedtime routine. Same book (Big Red Barn), same CD (Hidden in My Heart: a lullaby journey through Scripture), prayers, kisses. And the very first night she fell asleep peacefully, no tears, no fussing. And that is God’s word for Lydia. His truth and my prayer. She will never be alone. This idea struck me to the core. This is one of God’s most incredible promises in scripture. To never leave us orphans. How grateful I am to live into this truth daily. God is with me. I can know him. And because of this truth, I can rest. And so too, can Lydia. She can rest knowing she is not alone. The day after the big girl bed went up Lars preached a sermon. It was about this truth from Scripture and about Lydia. Read it here. After a couple weeks of sleeping with Lydia we moved to sitting in the blue chair until she fell asleep and then quietly slipping out. And then just three weeks ago, Lars decided to try what had worked with the boys. He said good-night and left the room. She cried. He came back in, said, “put your head on your pillow honey, goodnight, love you, I’ll be here in the morning.” He left, she cried. He did this for an hour. And then she finally put her head on her pillow and went to sleep. And that was it. She sleeps. And the key words for her were, “love you, I’ll be here in the morning.” I have actually watched her body relax as I speak those words. She is believing those words to be true. She is resting. Three months ago today, Lydia walked into my arms and went from orphan to beloved daughter. And by God’s grace she is resting in our love and the knowing that we will be there in the morning. She will never be alone. How good God is to give her (and us) that awesome promise. Tears, tears, tears. Precious, adorable, amazing, wonderful. Love you. Happy Birthday Lydee Lou. I would have never thought it was the crib. Amazing! I’m happy for you that Lydia can get a night’s sleep now. I know you two are happy, too. I just happened upon your blog and loved reading the story of God bringing Lydia into your family. I remember so well our own journey eight years ago to bring our little treasure, Cecilia home from China. I too felt such mixed emotions during our stay there–joy & thankfulness as well as sorrow for the girls, their birth parents, and China for their losses. What a blessing we received in the form of a beautiful, busy, stubborn, loving little girl! i found your blog as we’re at the beginning of our journey to adopt a little one from Haiti. i came across your blog through adopt together.com. i have loved reading your journey as well as hearing your insight on the adjustment. i’ve read so many different blogs and yours shares the journey so well. you’re such a great mama. 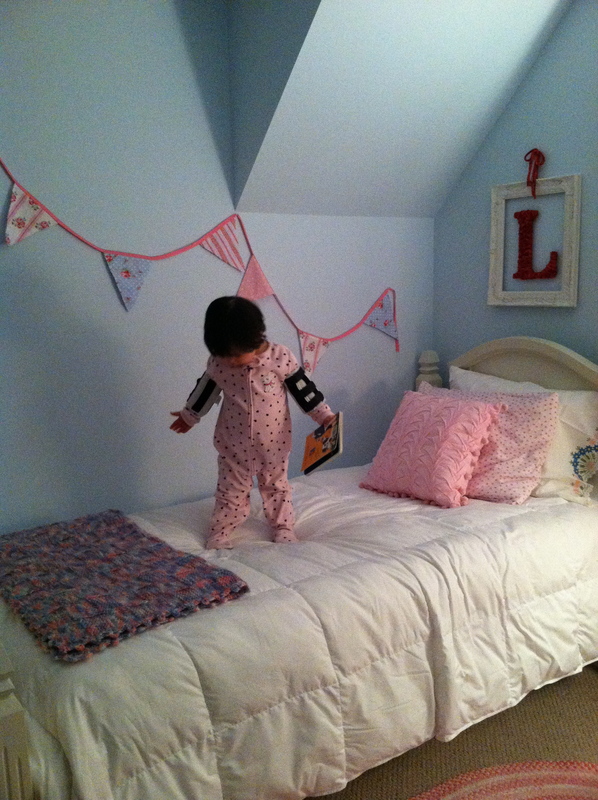 i can’t imagine how hard that would have been to have transitioned out of the crib already, but you did a great job! So glad you found our blog. I hope it encourages you in the waiting! Blessings on your journey to your child in Haiti! This is so beautiful and totally made me cry! I found your blog this morning and can’t stop reading it! We are on track to travel in May to bring our daughter home from China- same age as Lydia was and our daughter, too will have two older siblings! What a comfort it is to find similar stories and see God’s faithfulness! Thank you for sharing! If only we lived closer, our girls could play 😉 God bless you guys!